Sited among the trees on the eastern shore of Lake Pauline, the first floor of this waterfront home has an entryway (mudroom), an open kitchen-dining area with sliders onto a deck facing the lake, a living room with a fireplace/woodstove and a cathedral ceiling, two bedrooms and a full bathroom with a tub. Upstairs is a comfortable open loft bedroom, second bath with a shower, a laundry area with a washer and dryer and a nook with a futon/love-seat. 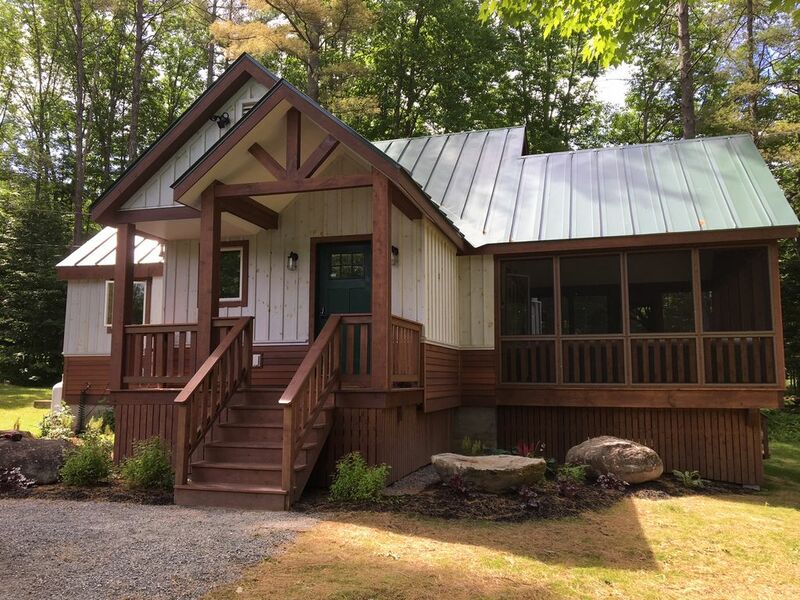 Built as a year-round camp in 1972, this cottage was extensively renovated in 2006, including all new appliances, granite-topped kitchen counters, tile bathrooms, hardwood floors in the kitchen-dining area and carpet throughout the rest. The major systems (electric, plumbing, heating, well and septic) have all been updated too, providing that elusive balance between rustic charm and care-free reliability. This house is the perfect summer getaway and Winter haven for Skiers. Please be our guest! Born and Raised in NJ. Moved to Vermont in 2011. My family and I have fallen in love with everything this state has to offer and purchased this cottage in 2013. Living a few hours north of Lake Pauline, I stumbled across this area simply by chance a few years back. I wanted to take a last minute vacation with my family during the July 4th weekend and ended up exploring this portion of Vermont. We all had an excellent time on Lake Pauline, and we knew right away that we wanted to own a home that was close to top notch ski resorts in the winter, and lakefront for the summer months. We could not have found a more perfect combination for year round relaxation. This cottage has everything you need. It sits directly on 165 feet of lakefront property surrounded by 1 acre of private and peaceful land. It is approximately 2 miles from Okemo, and 15 miles from Killington. The town of Ludlow is home to various restaurants, bars, and plenty to do. There is literally something here for everyone. Located on the eastern shore of Lake Pauline, with 165 feet of personal lake front in a secluded and peaceful 1 acre lot. Go swimming, fishing off your own dock or use the canoe and kayak on site. Table sits 2-4 and Breakfast bar can seat up to 4. Cozy cabin perfect for two small families! Nice large mud room to stow all your weather gear so you can kick back and relax at the kitchen island while cooking or by the wood burning stove in the cathedral ceiling living room—so you aren’t swimming in the clutter of your boots, coats and other travel stuff. This location would be 5 stars with a couple minor upgrades to kitchen amenities...but that only matters when the chef in the family writes the review...:-)! Would definitely recommend and return ourselves...any season! We had a lovely family stay at this house and enjoyed spending time in the area; skiing, hiking with the dog, dining in and out and spending time around the fire. The house has been renovated recently and we appreciated the new feel and the heated mud/ski room. Would recommend and we hope to come back soon. Everything a Vermont ski house should be and more. List of amenities. Free use of canoes, wood for fire pit, overall a very enjoyable experience. Our kids had a blast on the property and lake. Would definitely return back again for a weekend getaway. The cabin is clean, cozy, and nicely updated. My favorite part was the big screened in porch with plenty of space to lounge or gather for a meal. The house has plenty of privacy. The fire pit and outdoor speakers are perfect for hanging out under the stars. We also enjoyed the badminton net out back. You can canoe or kayak right over to the Sugar House and grab an ice cream; or a short distance down to the dam, where our group did some swimming in Lake Rescue. The little town of Ludlow was really cute, too. Rob's rental is an ideal spot to unwind. A great cabin by the lake - it made for a wonderful vacation for our family! My husband and I loved the screened in porch, swimming in the lake, using the canoe and kayak, and even using the outdoor shower. Our teenage kids had a great time fishing right off the dock and kayaking. No motorized boats on this lake. We paddled across the lake right to the Green Mountain House for maple flavor soft serve ice cream- a simple treat but these small things made it for us! The place was clean and we loved the layout, great light and airiness. I was able to see the kids on the dock while cooking dinner in the kitchen. We rented an extra kayak that the nearby Tyson Store delivered. It’s also a convenient store with fishing stuff. You may also want to check out a few of these nearby attractions that we enjoyed – the Weston Playhouse-a nice one, Okemo‘s Adventure Zone-a fun challenge course, rock climbing wall etc, and Buttermilk Falls for exciting cliff jumping! We were all very happy with this place, it was what we had hoped for and more! Loved the screened in porch! On the lake, kayaked and canoed! Great firepit too! Located on the eastern shore of Lake Pauline, less than 2 miles from Okemo Mountain and 15 miles south of Killington. In an area with world class skiing, biking, hiking and vibrant arts, crafts and music scenes, easily accessible from the major metropolitan areas of New York and Boston.